Matthew Apgar - mapgar@shawmedia.com Woodstock North wrestler Josh Serginia, listens to his headphones as teammate Chris Flores rests during the Class 2A Harvard Individual Regional wrestling tournament on Saturday, Feb. 6, 2016 at Harvard High School in Harvard. Matthew Apgar - mapgar@shawmedia.com Prairie Ridge's Travis Piotrowski holds up four fingers for the crowd as he has his arm raised in victory after recording a fall on Harvard's Reiss Bielski in 0:48 during their 126 pound Class 2A Harvard Individual Regional wrestling final on Saturday, Feb. 6, 2016 at Harvard High School in Harvard. With the victory, Piotrowski clinched his fourth regional title and remains undefeated on the season. Matthew Apgar - mapgar@shawmedia.com Marian Central coach Chris Taylor talks with 152 pound wrestler Joe Herff to get him focused on his next match for third place after being defeated by Johnsburg's Austin Butler with a 4-2 decision in the Class 2A Harvard Individual Regional wrestling tournament on Saturday, Feb. 6, 2016 at Harvard High School in Harvard. Herff would win his next match 13-2 to take third place in the regional. 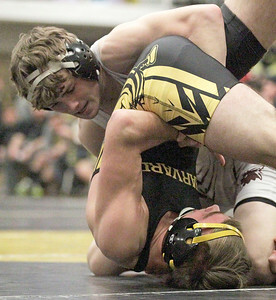 Matthew Apgar - mapgar@shawmedia.com Wrestlers compete in the Class 2A Harvard Individual Regional wrestling tournament on Saturday, Feb. 6, 2016 at Harvard High School in Harvard. Matthew Apgar - mapgar@shawmedia.com Crystal Lake Central's Lenny Peterson picks up Richmond-Burton's Gavin Sutton during their 138 pound Class 2A Harvard Individual Regional wrestling final on Saturday, Feb. 6, 2016 at Harvard High School in Harvard. Peterson won by 7-2 decision. Matthew Apgar - mapgar@shawmedia.com A dejected wrester finds a quiet spot away from the gym to reflect on his match in the Class 2A Harvard Individual Regional wrestling tournament on Saturday, Feb. 6, 2016 at Harvard High School in Harvard. Matthew Apgar - mapgar@shawmedia.com Marian Central's Anthony Randazzo, left, and Justin Wilcox of Harvard wrestle in their 132 pound Class 2A Harvard Individual Regional wrestling final on Saturday, Feb. 6, 2016 at Harvard High School in Harvard. Randazzo won by 5-0 decision. 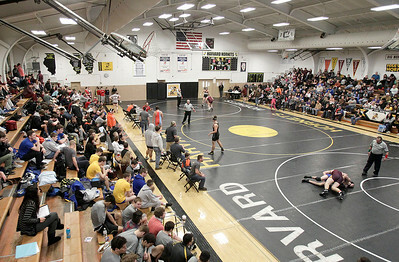 Matthew Apgar - mapgar@shawmedia.com Organizers keep busy as they continually update brackets with results from the Class 2A Harvard Individual Regional wrestling tournament on Saturday, Feb. 6, 2016 at Harvard High School in Harvard. Matthew Apgar - mapgar@shawmedia.com Michael Peterson of Crystal Lake Central, left, tries to fold up Sergio Jimenez of Harvard in their 145 pound Class 2A Harvard Individual Regional wrestling final on Saturday, Feb. 6, 2016 at Harvard High School in Harvard. Peterson won by fall in 4:31. Matthew Apgar - mapgar@shawmedia.com Crystal Lake Central's Lenny Petersen, left, and Gavin Sutton of Richmond-Burton wrestle in their 138 pound Class 2A Harvard Individual Regional wrestling final on Saturday, Feb. 6, 2016 at Harvard High School in Harvard. Peterson won by decision, 7-2. Matthew Apgar - mapgar@shawmedia.com Woodstock 220 pound wrester Devonte Spiller finds a quiet spot in the locker room to collect himself after being defeated by Johnsburg's Erik Juveland with a 6-3 decision in the Class 2A Harvard Individual Regional wrestling tournament on Saturday, Feb. 6, 2016 at Harvard High School in Harvard. Matthew Apgar - mapgar@shawmedia.com Crystal Lake Central's Brock Montford winces as he tries wrestles Harvard's Joshua Fiegel during their 113 pound Class 2A Harvard Individual Regional wrestling final on Saturday, Feb. 6, 2016 at Harvard High School in Harvard. Fiegel won by fall in 3:56. 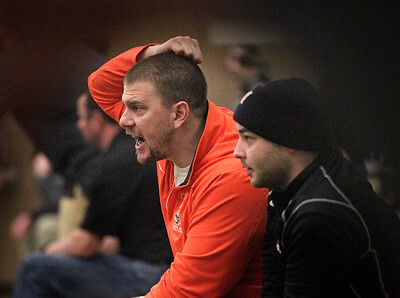 Matthew Apgar - mapgar@shawmedia.com Crystal Lake Central wrestling coaches Justen Lehr, left, and Sam Brody get vocal on the mat as Lenny Peterson wrestles in his 138 pound Class 2A Harvard Individual Regional wrestling final on Saturday, Feb. 6, 2016 at Harvard High School in Harvard. Peterson won with a 7-2 decision. 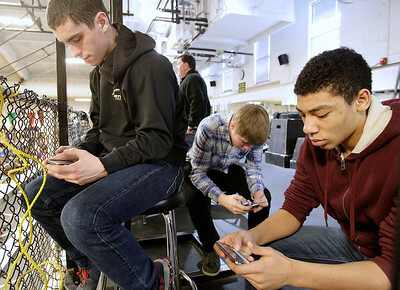 Matthew Apgar - mapgar@shawmedia.com Harvard students play a game on their phones while enjoying a break from helping in the Class 2A Harvard Individual Regional wrestling tournament on Saturday, Feb. 6, 2016 at Harvard High School in Harvard. Matthew Apgar - mapgar@shawmedia.com Marian Central 132 pound wrestler Anthony Randazzo takes a look at the brackets in the Class 2A Harvard Individual Regional wrestling tournament on Saturday, Feb. 6, 2016 at Harvard High School in Harvard. 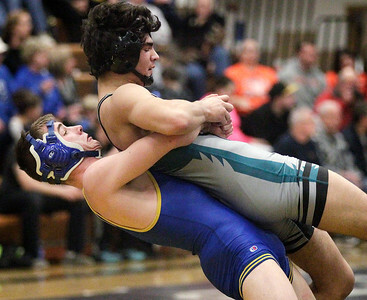 Randazzo would go on to win the regional title for his 132 pound weight class. 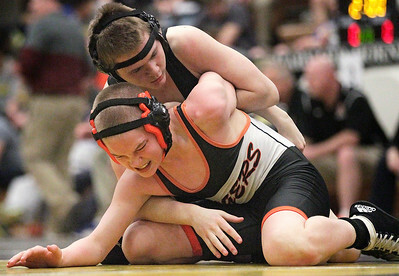 Matthew Apgar - mapgar@shawmedia.com Harvard's Joshua Fiegel, top, takes control of Crystal Lake Central's Brock Montford during their 113 pound Class 2A Harvard Individual Regional wrestling final on Saturday, Feb. 6, 2016 at Harvard High School in Harvard. Fiegel won by fall in 3:56. 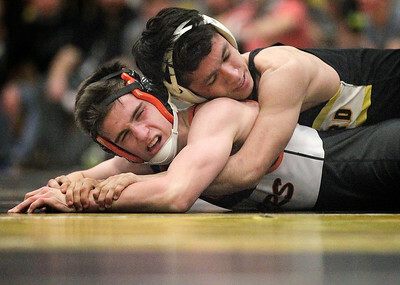 Matthew Apgar - mapgar@shawmedia.com Harvard's Sergio Esquivel, top, controls Connor Burns of Crystal Lake Central during their 120 pound Class 2A Harvard Individual Regional wrestling final on Saturday, Feb. 6, 2016 at Harvard High School in Harvard. Matthew Apgar - mapgar@shawmedia.com Marian Central's Anthony Randazzo, front, and Justin Wilcox of Harvard wrestle in their 132 pound Class 2A Harvard Individual Regional wrestling final on Saturday, Feb. 6, 2016 at Harvard High School in Harvard. Randazzo won by 5-0 decision. Matthew Apgar - mapgar@shawmedia.com Marian Central 152 pound wrestler Joe Herff finds a quiet spot to rest and prepare for his next match for third place after being defeated by Johnsburg's Austin Butler with a 4-2 decision in the Class 2A Harvard Individual Regional wrestling tournament on Saturday, Feb. 6, 2016 at Harvard High School in Harvard. Matthew Apgar - mapgar@shawmedia.com Marian Central's Anthony Randazzo, top, and Justin Wilcox of Harvard wrestle in their 132 pound Class 2A Harvard Individual Regional wrestling final on Saturday, Feb. 6, 2016 at Harvard High School in Harvard. Randazzo won by 5-0 decision. Matthew Apgar - mapgar@shawmedia.com Johnsburg's Austin Butler, left, picks up Woodstock North's Jake Fiorito during their 152 pound Class 2A Harvard Individual Regional wrestling final on Saturday, Feb. 6, 2016 at Harvard High School in Harvard. Fioritto won by decision, 7-1. 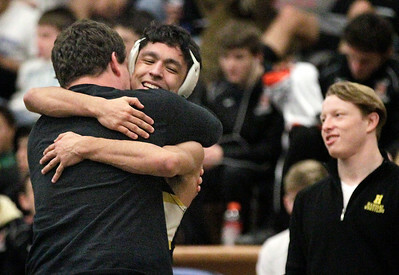 Matthew Apgar - mapgar@shawmedia.com Harvard's Sergio Esquivel is met with a hug after winning the 120 pound weight class in the Class 2A Harvard Individual Regional wrestling tournament on Saturday, Feb. 6, 2016 at Harvard High School in Harvard. Matthew Apgar - mapgar@shawmedia.com Prairie Ridge's Travis Piotrowski, top, folds up Harvard's Reiss Bielski during their 126 pound Class 2A Harvard Individual Regional wrestling final on Saturday, Feb. 6, 2016 at Harvard High School in Harvard. Piotrowski won by fall in 0:48, remaining undefeated on the season and clinching his fourth regional title. 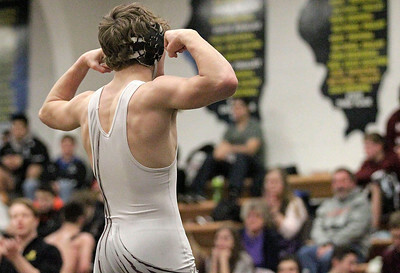 Matthew Apgar - mapgar@shawmedia.com Prairie Ridge's Travis Piotrowski flexes his muscles for the crowd after recording a fall on Harvard's Reiss Bielski in 0:48 during their 126 pound Class 2A Harvard Individual Regional wrestling final on Saturday, Feb. 6, 2016 at Harvard High School in Harvard. 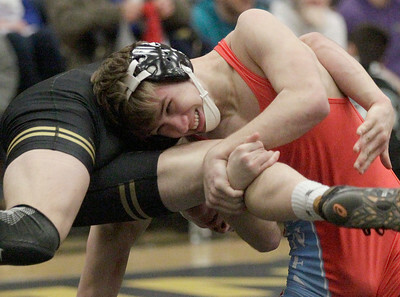 With the victory, Piotrowski clinched his fourth regional title and remains undefeated on the season. 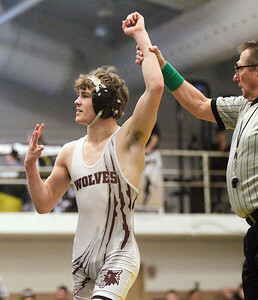 Prairie Ridge's Travis Piotrowski holds up four fingers for the crowd as he has his arm raised in victory after recording a fall on Harvard's Reiss Bielski in 0:48 during their 126 pound Class 2A Harvard Individual Regional wrestling final on Saturday, Feb. 6, 2016 at Harvard High School in Harvard. 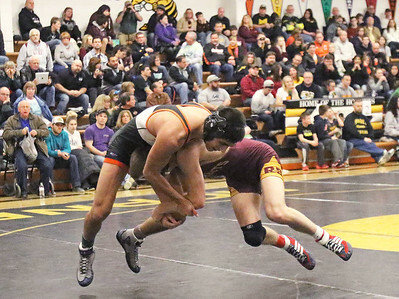 With the victory, Piotrowski clinched his fourth regional title and remains undefeated on the season.